Welcome to another SUO Challenge! These theme challenges are just soooo much fun! Our theme this time is Featuring Flowers and with sooooo many wonderful Stampin’ Up! flowers from which to choose, it is TOUGH to narrow it down! As I said yesterday my friend Jackie won a set of the Pumpkin Pie Blendability Markers at the Mason Unite and Excite SU event and when she came over on Saturday…I got to PLAY! Since I already had these done…I figured…WHY NOT! Oh…I just LOVE to color with these things! Old Olive dsp (Brights Paper Pack) – 3 3/4 x 5, layer on Whisper White 3 7/8 x 5 1/8. Take a tag from the Celebration Banner Kit, stamp hello (a Dozen Thoughts) using Basic Black, add tag using dimensionals. Wrap Pumpkin Pie Chevron Ribbon around panel and add to card front. Stamp the tulips using Memento Black ink two times. Stamp the stems/leaves using Pear Pizzazz/Old Olive. Cut out and add to card front using dimensionals. Color the flowers using the three shades of Pumpkin Pie Blendabilities, cut out and add to the card tulip image using dimensionals. Don’t forget to check out what the rest of the design team did with their flowers! This entry was posted in Spring Mini, SUO Challenge and tagged A Dozen Thoughts, Blessed Easter. Bookmark the permalink. 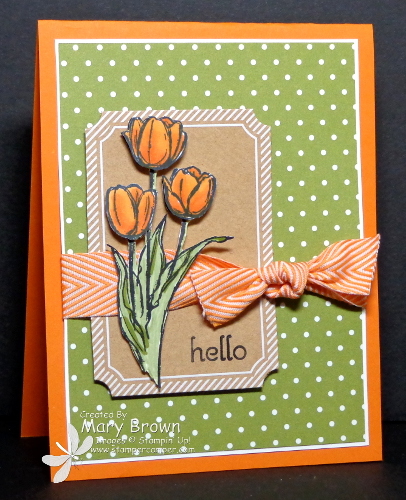 Love the bright tulips on this card Mary and the way you tied the ribbon. Lucky you getting to play with Blendabilities already – can’t wait for them to arrive here! This set is so pretty cut out!